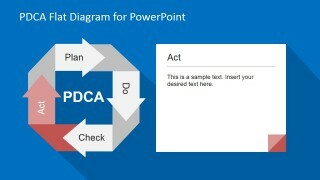 PDCA Flat Diagram for PowerPoint is a template based on the PDCA (Plan, Do, Check, and Act) cycle developed by W. Edwards Deming. The PDCA diagram, commonly referred to as the Deming cycle, is a strategic four-step management tool used in the ceaseless improvement of products and systems. The Plan-Do-Check-Act cycle was first used in Japan and resulted to the implementation of “Kaizen” (good change) in the country. 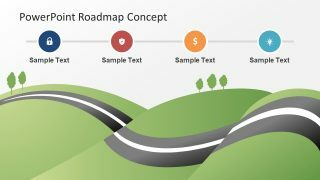 The cycle begins with the planning phase (Plan), then it goes to the production or doing phase (Do), after which the results are evaluated (Check) in order to provide better satisfactory results (Act). 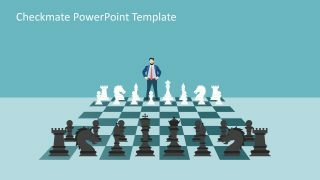 During the year the PDCA was renamed to PDSA (Plan-Do-Study-Act) to change the approach of the method to focus on analyzing situations instead of controlling.According to Deming, the PDCA cycle is designed for teams working on problems at the local level. 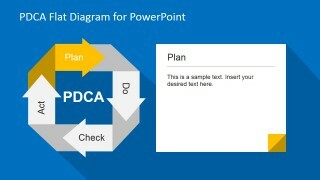 The PDSA cycle, on the other hand, is a quality control program for management. The PDCA cycle is sometimes called the Shewhart cycle, named after Walter Shewhart, the father of statistical quality control and pioneer of the cyclical concept. 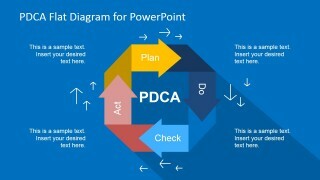 Shewhart’s three-step process–specification, production, inspection–inspired Deming to develop the PDSA cycle which resulted to the development of the PDCA cycle in Japan, where Deming conducted lectures of the subject. The PDCA model is, therefore, a methodical approach to problem solving with an emphasis on assessing feedback to improve goods. 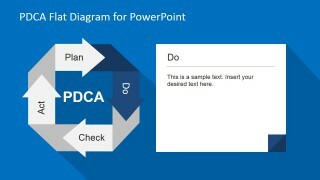 Companies like Toyota are using the PDCA cycle to improve their products. 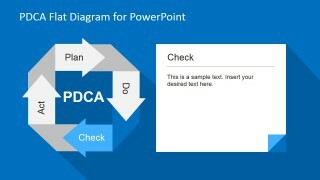 Apart from manufacturing, the PDCA Flat Design PowerPoint Diagram can be used in the medical industry as well as social services and schools. 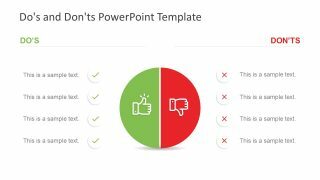 Our PDCA Flat Diagram for PowerPoint is completely created with PowerPoint objects allowing the user to fully customize its appearance (size, color, effects, etc.) 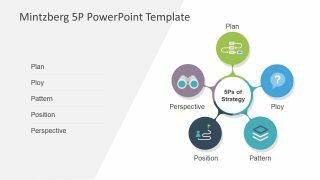 Impress your audience with this professional PowerPoint Business Template that appeals to executive audiences.